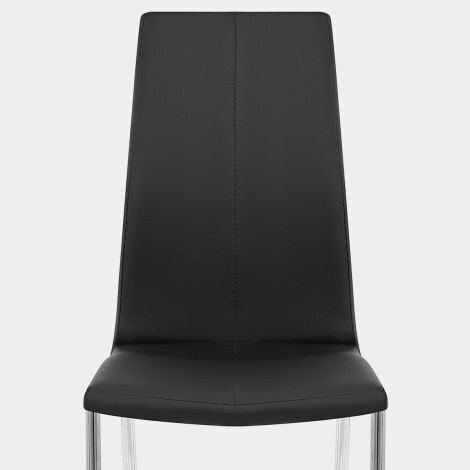 The striking Kudos Dining Chair Black is a modern masterpiece, a functional item that will also add a brilliant focal point to any dining room. Ergonomically designed to bring the greatest comfort, the Kudos will add a stylish status to your home. The accommodating and comfortable seat is padded and covered in luxuriant black faux leather, with a line of stitching bisecting its entirety including the tall supportive backrest. The comfort is enhanced by the stability provided from the four legs beneath, which are expertly crafted from steel and plated in durable chrome for a reflective finish that simply reflects its surroundings. Protective pads at the base of each leg make the Kudos perfect for all types of flooring, adding further to its desirability. "Stylish looking chair. Goes well in our kitchen"
Exactly as expected and much cheaper than the same chair from other suppliers. Delivered very quickly. Chair was easy assembled, it is very comfortable and looks great. Very pleased with my purchase. Once again, Atlantic shopping has been brilliant! Excellent customer service together with an excellent product and a good price to round off the experience. Just what we needed to replace our six old breakfast room chairs. These are well built, light and very comfortable. Importantly they are not at all noisy when moving across a tile floor. Great website, fast delivery and good value for money. Bought these and they are super comfortable to sit on. Would be great if they came in other colours.